For over 30 years, The Flat Roof Company has been a trusted name in the service, repair, replacement and installation of flat and metal roof systems in both commercial and industrial applications across the St. Louis area. Our highly placed emphasis on customer satisfaction has allowed us to develop a high-quality installation and repair process while maintaining the most cost-effective pricing for the roofs we service. Our team will carefully asess your building's current TPO, modified bitumen or metal roofing situation. Once we develop a plan of action that suits your building and budget, we will begin servicing your roof. We make all repairs using the industry's most turnkey methods for restoration with a 100% Leak Free Guarantee. 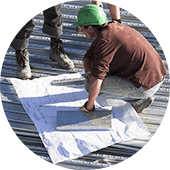 Our process begins with an on-site consultation, where we assess your building’s current flat or metal roof system. Our team of expert technicians will carefully inspect the condition of the current roofing system, and make cost-effective recommendations based on our over 30 years of roofing experience. Once we develop a plan of action that suits your building and budget, we will begin servicing your flat or metal roof. All of our services are backed by a 100% Leak Free Guarantee that ensures that our final product will be able to withstand years of harsh Midwest weather conditions, sun damage and other wear-and-tear and gives our customers the peace of mind that their roof will stand strong. 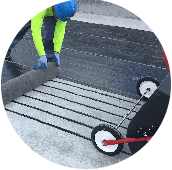 The Flat Roof Company has become one of St. Louis’ most trusted sources for all commercial and industrial flat roof needs. To begin your free consultation, contact us today!